This energetic medley of gospel favorites opens slowly and freely with Softly and Tenderly Jesus Is Calling. Switching gears into an up tempo bluegrass style; it escalates in key; dynamics and tempo through three more choruses: I'll Be Somewhere Listening for My Name (popularized by the movie; O Brother; Where Art Thou? ); New Name in Glory; and Just Over in the Gloryland. Harlan's stylized accompaniment perfectly complements the voices. 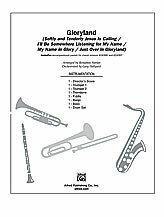 InstruPax includes parts for 2 trumpets; trombone; fiddle; banjo; bass; drumset; director score.